← The Powder Horn Blew Up! Silence hung over the clearing for as long as it took the white, sulfurous stench to drift down range and dissipate. Before I got close, there was no question the fourth turkey was dead. I knelt beside the cardboard box, now riddled with #5 lead shot, and peeled off the target. The chrome stapler snapped four times. I rolled the box upright and shifted it in the grass so the next turkey’s head was square with the shooting bench. The hen sounded young. I was maybe three paces from the pickup’s tailgate. I wiped the frizzen clean with the loading rag, then the flint, and finally the pan. I took care while measuring the powder charge, then selected two oak leaves, rolled them each in a ball and rammed them firm over the powder. The sound of shot rattling in trade gun’s barrel carries a sense of urgency, at least for me. With another leaf-ball packed tight on the shot, I started the short walk to the old picnic table I use as a shooting bench. “Okay, junior, see how you like this load,” I said in a whispery voice as black granules trickled into the pan. I thought of Wayne Lamson’s bench shooting lesson last summer, eased my grip on the wrist and steered the turtle sight with my shoulder. 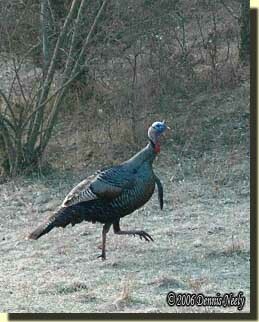 “Old Turkey Feathers’” muzzle clung to the turkey’s neck and hovered over the crossed lines. I didn’t have to wait more than a dozen seconds. Quiet fell as quick as the English flint did. The Northwest gun rested against the tailgate. Smoke curled from the muzzle and the touch hole. “Junior, you’re dead again,” I said before I got to the target. “This is the best so far.” My finger counted twelve pellets in the brain and spine areas and another twelve in the head and neck. The turkeys and I played a game of “cat and mouse” that fine March afternoon. I only had time for a few shots. I wasn’t out of the truck when I heard the first gobble on the hog back. The hen teased before the tailgate thumped open. The gobbler called again while I filled the horn. In a while, I sat on the picnic table’s seat, thinking I had heard the last of the romantic banter. The sear was sliding out of the tumbler when he gobbled again. I laughed and had to regain my composure. 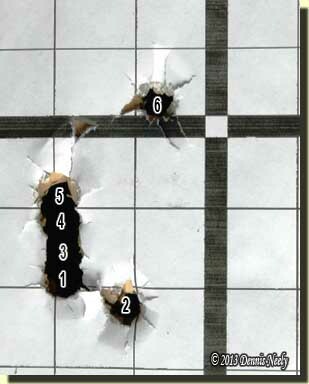 Test patterning shot loads at the range is supposed to be serious business. The tom’s gobble, my shot, the trip to put out a fresh turkey head and the hen’s clucking stayed synchronized throughout the range test. Six targets eased my doubts about the leaf wadded shot column. I tossed the last target on the front seat, then started to stow the measure and shot bag. I hated to leave the clearing, besides, I still had time left for another four or five shots. Curiosity is sometimes my undoing. Throughout deer hunting season I keep a cardboard box in the back of the pickup with a round ball sighting target stapled on it. I like to set it out at about 40 paces when I discharge a load that has been in the trade gun for more than a couple of days. I usually shoot offhand, convincing myself this is the best shot at a fine buck. I like to see where the shot impacts. That target was on the front seat, so I re-stapled it and set it out at 28 paces. I don’t have many round balls left from the last casting, two dozen, if I’m lucky. I loaded the trade gun using oak leaf wadding, then took my seat at the bench. I waited for the usual gobble, but the spell was broken, which seemed fitting. The first shot hit two inches low and to the left. I was a bit frustrated with myself, but I haven’t shot a lot in the last two years, either. I knew my sight picture was incorrect; from experience, I understood what was wrong. I made a conscious choice to continue with the incorrect sight picture in favor of seeing how well I could group. The second was closer to the vertical aiming line and a tad lower, which I put off to not concentrating like I should have. After all, this was supposed to be fun. When the smoke cleared the third round ball’s hole touched the top of the first. The fourth walked up the line, and at that point, I decided to try once more. The leaf wad seemed tighter when the wiping stick rammed it home, but I expected that because I was not wiping the bore between shots. The round ball hung up in the fouling and had to be tapped down, too. If I could squeeze off the shot in the same manner as the first four, I expected to stack another hole on the pile. I had to ease off and re-gather my thoughts and settle in a second time. The fifth shot continued the walk up the line, consistent with my expectations. The allotted time was spent, but I couldn’t resist one more try. I have learned in such situations to just load and maintain a rhythm, keeping a close eye on consistency, of course. The forestock soon rested on the blocks, I maintained the incorrect sight picture, but took a new aiming point, one inch above center and two to the right. I had a hard time seeing the intersection of those lines, plus I had heat ghosts rising from the barrel. The sixth shot printed ½-inch high and ¾-inch left of dead center. The fun was over, and I packed up. But, as so often happens, the impromptu round ball shots tweaked my curiosity. My goal has always been to master the use of natural wadding to the point of duplicating the accuracy our forefathers experienced. With that session, I feel I came a bit closer to that reality, but I also came away with more questions than answers. Such is the traditional hunter’s lot. 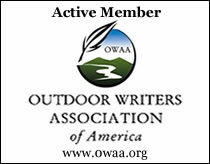 This entry was posted in Research and tagged Dennis Neely, historical trekking, North West trade gun, Northwest trade gun, trade gun, traditional black powder, traditional black powder hunting, traditional blackpowder, traditional blackpowder hunting. Bookmark the permalink. “but I also came away with more questions than answers. Such is the traditional hunter’s lot.”……YUP!! LOL! Thanks for the post! That is a reassuring rb target. You will remember that accuracy in the fall when the winter’s venison is in your sights. I shoot SOOOOOO much better when I have confidence in my kit.